NEW ORLEANS – With indoor season in the books and the outdoor season already underway, it’s time for the Week One Edition of the NCAA Division II Men’s and Women’s Outdoor Track & Field National Rating Index which was released by the U.S. Track & Field and Cross Country Coaches Association (USTFCCCA) on Tuesday. 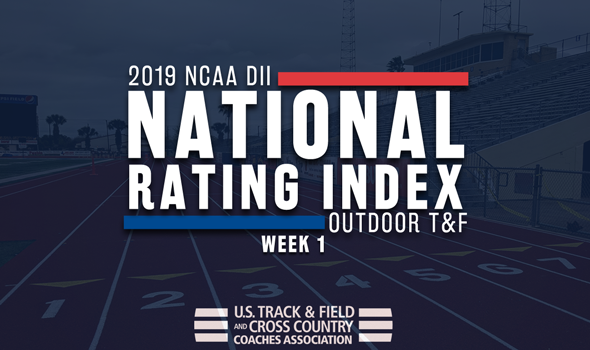 The National Rating Index takes into account all performances posted so far this outdoor season and uses a point system to then rank those performances against each other, which then are combined to give a final team score. The early editions of the index might be slightly impacted by weather, as you can’t receive a ranking if you have not yet competed during outdoors, which leaves very few eastern and northern teams in the top-25 to begin the season. That makes it all the more important to keep checking our releases each week as big changes will start to occur weekly once the snow clears and the cold gives way to warmer temperatures across the nation. No matter location at the end of the day, all of the nation is battling for the 2019 NCAA Division II Outdoor Track & Field Championships set for May 23-25 in Kingsville, Texas. For the third outdoor season in a row and the fifth time in the past six years, Chico State opens the year as the No. 1 team in the country. The Wildcats have already competed in three meets to kick off outdoors and have been led so far by Jack Johnson (second in the nation in the steeple), Tyler Arroyo (third in the high jump), Lance Huber (third in the pole vault), Isaiah Roybal (fifth in the long jump) and Dylan Smith (fifth in the decathlon), among others. The group’s 4×400 is also ranked third overall. Next up is Angelo State which starts the year in the No. 2 position. The Rams have also competed in multiple meets to open outdoors with their relay teams leading the charge. The 4×100 squad is tops in the nation while the 4×400 is second overall. Individual top contributions have come from Decio Andrade (first in the hammer throw), Trivett Jones (second in the pole vault), Demontravous Jones (fourth in the 400), Creede Goode (fourth in the decathalon) and Matthew Walsh (fifth in the triple jump). Coming in at No. 3 is Embry-Riddle (Fla.) which is the best mark received by the program in school history. The Eagles have multiple top-ranked athletes so far this year in Calahan Warren (leads the country in the 1500 and is second overall in the 800), Brodie Lubelski (tops in the shot put and fourth in the discus), Connor Guinn (second in the decathlon) and Lonnie Marts (third in the decathlon). Slotting in next at No. 4 was UC San Diego which is the best mark received by the school since opening third overall to start the outdoor season in 2017. Top athletes so far for the Tritons include Kiasa Salgado (leads the country in the 400H), Matt Bowen (tops in the triple jump), Nicholas Rack (third in the 110H), Josef Polk (third in the 400H) and Evan Shimasaki (third in the pole vault). Rounding out the top-5 at No. 5 was Lenn (Tenn.) with 21 event entries in the index. It is also the best mark received in program history. The Flames have been led so far by the trio of Justin Brooks (the top athlete in the 400 and fourth overall in the 200), Christian Noble (first in the steeple and fifth in the 5000) and Josiah Brooks (third in the 200 and fourth in the 100). The rest of the top-10 was completed by Cal Poly Pomona, Academy of Art, Western Washington, Saint Augustine’s and Cal State Stanislaus, in that order. Angelo State was selected as the top team in the nation to open the outdoor season for the second time in the past three years. The Rams have three athletes currently ranked as the top performer in their events in Talena Murray (javelin), Karlea Duhon (heptathlon) and Daisy Osakue (discus). Top contributions have also come from Jordan Nash (second overall in the heptathlon and fifth in the 400H) and Kaitlyn Matthews (second in the triple jump). The programs 4×400 unit is also fourth in the country. It is the first time Angelo State has received the top rank since Week 4 rankings of last year’s outdoor season. Coming in at No. 2 is Azusa Pacific which ties for the best mark received in program history. The Cougars have the top pole vaulters in the country currently in Sara Wagenveld and Abigail Gray to go with top athletes in Elle Alexander (second in the nation in the discus and fourth in the hammer throw), Elise Larson (fourth in the 5000), Amadna Passold (fourth in the pole vault) and Abigail Hume and Chinenye Agina (both tied for fourth in the high jump). The last time Azusa Pacific was No. 2 was the Week 4 rankings of the 2015 season. Next up at No. 3 is UC San Diego. The Tritons have multiple athletes at the top of the charts of their respective events which includes Claudia Cox (leads the nation in the 400H), Gabbie Eshiet (tops in the shot put), Kelly Strand (second overall in the 400H) and Natalie Caraway (second in the high jump). It is the best ranking received by UC San Diego since opening outdoors as the No. 1 team in the nation to start the 2016 season. Following them at No. 4 is SF State. The Gators also have some of the top-ranked athletes in the nation which starts with the country’s best 4×100 and 4×400 groups. Other early season standouts go to Timarya Baynard (nationally No. 1 in the 400), Jazmine Smith (third in the 400), Monisha Lewis (third in the 100) and Alexis Henry (fourth in the 200). Completing the top-5 at No. 5 was Academy of Art thanks to some of the top-ranked athletes in the nation across multiple disciplines. Even though the Urban Knights have “only” 16 event entries on the index, that list includes top-ranked Ombretta Minkus Meye in the 100 and Camille Jouanno in the triple jump along with Darria Matthias (second in the 200). Minkus Meye is also third nationally in the 200 while Jouanno holds the same position in the 100H. The Academy of Art hasn’t been ranked this high since earning the No. 5 spot back in Week 3 of 2014. The rest of the top-10 was completed in the following order: Fresno Pacific, Western Washington, Cal Poly Pomona, Cal State Stanislaus, and Alabama-Huntsville.